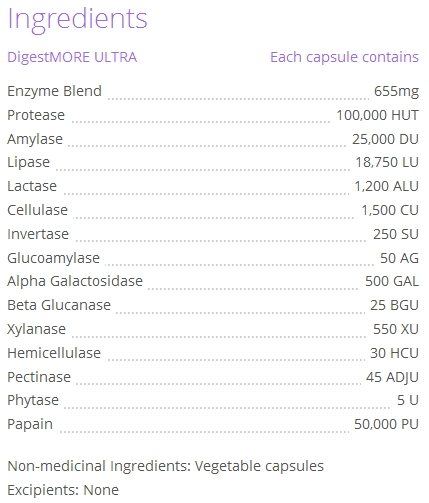 High potency DigestMORE ULTRA contains enzymes to breakdown all of the components of food. It can help to alleviate the signs of poor digestion such as gas, bloating, constipation, cramps and tiredness after eating. DigestMORE ULTRA is a therapeutic strength enzyme formula designed for those whose digestive problems are chronic and occur on a daily basis, or are serious in nature. When DigestMORE ULTRA is taken with a meal, it works to break down food products into their smallest usable components (nutrients). This allows the body to absorb the maximum amount of nutrients from your meal. When food is effectively broken down, the overall function of the digestive system is improved, including a reduction in the amount of gas produced. DigestMORE ULTRA contains no dairy, wheat, gluten, soy, corn, yeast, animal products, additives or preservatives. Dosage: Take one capsule with each meal. DigestMORE ULTRA should be taken on an ongoing basis to improve digestion.